The first time I heard that Arashi’s new album is called “The Digitalian”, I quickly checked my trusted best friend Oxford Dictionary. The term still has not made its entry (who knows, this year?) though it’s obvious where the word was derived from. Next, I Googled how digital music sounds like and I was directed to an entry about Japanese musician Tetsuya Komuro aka TK, the keyboardist of TM Network, who “coined” the word. I’m familiar with TM Network because Bananaman’s Yuki Himura performed “Get Wild” on Shiyagare with Arashi some time back and I love that song. 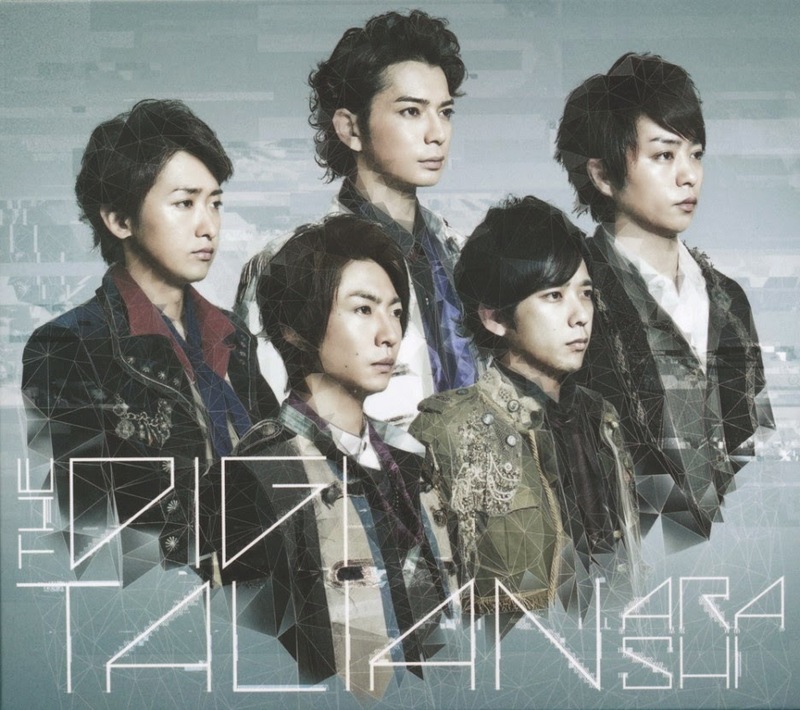 TK also produced “The Digitalian is Eating Breakfast” albums so out of curiosity I gave them a listen, trying to figure out how Arashi’s next album will sound like. And I liked it. But I have to admit that like many others, I was scared of the word “digitalian” and how Arashi might end up sounding, well, K-pop. So listening to how TK’s music sounded like, and thinking if this was going to be the basis and inspiration, it won’t be so bad. Just before the release of the lead track Zero-G’s first teaser, Arashi said the new album will still sound like them. Digital, electronic dance music (EDM) or however way you call it, I wouldn’t have a problem as long as it will have that Arashi sound. Besides, it’s a good thing they’re experimenting with different sounds and concepts. I don’t really listen to K-pop so I can’t make a fair comparison but my fears disappeared by the time they released a longer sampler of Zero-G. It sounds Arashi except of course that they put a lot of electronic elements there. By the time I listened to the full album, I have to say it’s not what I expected. And that’s both bad and good. The Love album is a tough act to follow. Love swept me off my feet from the first listen. Before that, Popcorn too. The thing with concept or thematic albums, you have to be consistent. But I don’t get that sense in The Digitalian, never mind Sho’s explanation on how he came up with the concept (Digital + Vegetarian). GUTS! sounds so out of place, for one, not that they could not include it and the other singles they released this year. Of course I don’t expect all the songs to be EDM, syncopated or electronic-sounding and it’s a good thing because it does offer something for everyone, especially those who are not keen on electronica. I have seen some tweets comparing Tell Me Why to 1D and One Step to BSB. Well at least if this is a “vegetarian” offering, it’s a bowl of mixed vegetables. I used to think that I had very specific preference when it comes to music. But now I can’t even remember what music I preferred pre-Arashi. Genre? What genre? Arashi has broken all that and gotten me into all sorts of music from A.Ra.Shi to P-A-R-A-D-O-X to Zero-G and everything in between. Of course they have certain songs I don’t like and surprisingly, in this album, it’s not the ones that sound overly digital at all. So. Do you Dig Italian? Despite falling short of expectations (I must have listened to Tetsuya Komuro a lot), I am slowly falling for the album. I guess the trick is to listen to it over and over again, not to get used to the sound, but to actually discover the music. Bittersweet (which, among the three singles in this album, fits the digitalian concept most) is the perfect example on how love can slowly develop; it doesn’t have to be love at first sight–or listen–all the time. My favorite tracks (not including singles Bittersweet, GUTS! and Daremo Shiranai) are One Step, Take Off!!!!! (did I count the exclamation points correctly?) 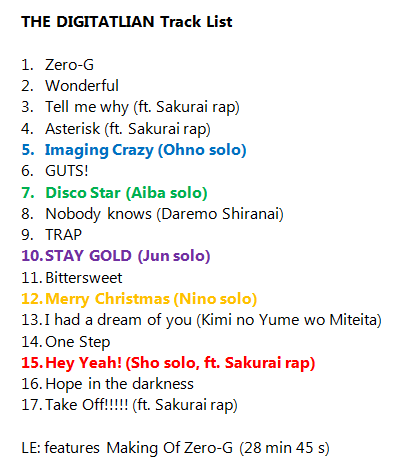 and Zero-G. My favorite solos are Nino’s (very Christmassy), Sho’s (@jhingnigami said she expects a choir, Whoopi Goldberg and nuns to come out for the chorus during the live) and Jun’s. Well, Aiba’s too. I think Riida’s solo is not just my type of beat. Let’s just say I like most of the songs but it’s taking a longer time to really get the groove of Wonderful and Trap. But I’m getting there. Many have also noted that Hope in the Darkness is V.2 of Cosmos (Popcorn) though it’s also the Ai Wo Utaou (Love) for me in this album. And that Asterisk (another favorite) is V.2 of Intergalactic. Take Off!!!!! in fact has that distinct Arashi-composed sound similar to Energy Song and Fight Song. And what I find lovely about Arashi is they sometimes pick bits and pieces from their previous songs like in Confusion (Love) that had A-Ra-Shi notes in it. As fans, of course we don’t have to like everything that our idols come up with. I’m not a blind fan (nor am I deaf even if I mishear Sho saying “c’mon stupid guys now” instead of “c’mon sing together now” in One Step) but I would always throw my support behind the artists I like knowing the effort they put into the work, whether music, TV show or film. Arashi comes up with only one album each year and that has been a lucky thing considering not all artists are able to release an album or do a tour yearly. I also feel their gratitude when they point this out every time. That is why I always look forward to their releases and I’m happy that they are growing with their music, experimenting and even writing their songs. When before only Nino and Sho wrote lyrics, in this album, Jun also partly wrote his solo. I’d like them to have more ownership of their music as they move forward to their 16th year and beyond. Jun said that arriving and leaving through a helicopter in their Hawaii concerts was a symbolism of them stopping by and continuing on their journey. In Take Off!!!! !, Sho said this is just the beginning of a new chapter and in many ways, The Digitalian does represent that. So, MY FELLOW ARASHIANS, do you dig Italian? I didn’t listen to Digitalian but very intrigued that both your bias groups experimented with EDM in their latest albums. CNBLUE x Arashi is real! hey, you forgot the “seriously”. yes, I did dig The Digitalian. I personally believed that thy have some personal touch here and there in all the songs and their respective solo. Actually, when I listened to Fly, one of the song in Guts, I kind of afraid because of their voices was digitalized (some said auto tune) and have a lil bit of K-Pop. But when I listen more to Fly, I kind of like it, catchy and fun. Seriously, I hope they will perform this live at 2014 tour, promoting The Digitalian. So, I LOVE THE DIGITALIAN. My favourites are Tell Me Why, Asterisk, Zero-G & Take Off!!. Every song gave a goosebumps, except the solos. I also gald that they released the original album, not ‘best’ album or ‘best’ selection for their 15th anniversary. p/s sorry for my mistake, if any. just from my bona fide opinion. I love Asterisk too! Many have mentioned that Asterisk is actually V.2 of Intergalactic (which I personally don’t like until now). In the same way that friends also pointed out Hope in the Darkness is V.2 of Cosmos. I find it interesting and it would be great if they could do a mashup between these songs at the live. yes I’m glad they released an original album for the 15th anniversary though I was hoping for something like a 5×15 song. But I will happily settle with Take Off!!! MY FELLOW ARASHIANS!!!!! Now you mention it, I personally think that Asterisk is like combination of Intergalactic + Cosmos + Waiting For you. Hope for Darkness remind me of Michael Jackson’s song. I’m not sure the title but if I’m not mistaken Save the World. I also like One Step. Sweet and soothing. I know, they have Sketch & 5×10. But Take Off!! just like Attack It, and I totally love it. Maybe they have another surprises, like TIFF maybe. Just hope but who know, maybe Uncle Johnny hears our prayers. Haha… MY FELLOW ARASHIAN!!!!! waaahhh you mentioned Waiting For You!!! one of my faves, if not the top, from Popcorn. Oh, and I forgot to mention that Tell Me Why really brought me back to Maboroshi and How Can I Love, together with Take Me Faraway maybe because Ohno-san voice was so strong in Tell Me Why. But maybe because I like Ohno-san voice every time Arashi has ballad song. Just like Matsumoto-san mentioned in Arashi Blast in Hawaii talk for JAL, I also love Ohno-san solo part in Be With You. I cried watching Aiba-san cried and cried again when Ohno-san solo part. Seriously, TIME is the best. I can’t stop when talking about Arashi song. Always listened to them anywhere, everywhere, anytime. Yup, just blamed myself because I was totally behind the news. When I first listen to the Dig Italian (like you said :p) I feel like there’s too many sound to follow. But as I listened to it everyday I’am starting to like it. For solo I like Nino’s and Sho’s. With time I came to understanding the other. Aiba’s solo really suits him, I think. Nino’s solo reminds me of AKB48’s Heavy Rotation actually. Especially the opening. The hardest one is Wonderfull. I don’t know why but it still feel weird to me. High touch on One Step!!! You’re not alone on Wonderful. Not many find it, well, wonderful. But I think it’s growing on me. Just try to listen to Heavy Rotation or some others and maybe you find the similarities..
Hye, I thought the same too, just because their voice was auto tune, doesn’t meant they sound like K-POP. I personally think, Arashi have their own genre. I also like BW album, fall in love instantly but LOVE take me some times. Popcorn was great but for me TIME is the best. Btw, nice to meet you. Ohhhh time is my fave album too!!! I also love the time concert! I think it’s the last concert dvd that we have a proper mc..lol! thank you!!! I need all the luck in the world for the Nagoya tix. I heard about the ruckus in tumblr but haven’t read it myself. I don’t buy the idea that just because we don’t like something, that makes us less a fan. Of course there’s a way of saying it and we can all discuss like adults and agree to disagree, right? thank you for dropping by! what’s your name on Twitter if you don’t mind me asking? sigh Arashi, why is it so difficult and expensive to see you? I don’t get why many compare J-Pop with K-Pop when K-Pop obviously copied J-Pop first. I don’t follow K-Pop either, and Japan still has the biggest music industry, so don’t care about the Korean wave. J-Pop is still the best.